On his way to stand trial for his crimes, the Federation Starship carrying Gul Dukat is attacked. Captain Sisko is travelling on board as well, and the pair end up stranded alone, seeking shelter in a cave. Waiting for rescue, whether by Dominion of Starfleet forces neither of them knows, Dukat becomes increasingly unstable. Even in this state he possesses a certain dignity, a graceful countenance. Kevin: I like this episode a lot. A lot of it is the acting, which I'll get to in a second. I think the episode avoids two pitfalls pretty cleanly. First, it is not boring. There is definitely enough drama here to sustain the 43 minutes of the show and then some. Second, this doesn't feel inorganic for Dukat. The writers and actor have done a great job shading his villainy, so this could feel like either character assassination or a retcon, but I don't think it does. His hatred for the Bajorans and the sting of technically losing to them has always simmered beneath the surface and his need for adulation has always been apparent, so his breakdown on those fault lines feels like an extension of those traits, not new traits out of nowhere. His partnering with Sisko to stop the Maquis back in Season 2 was not mere altruism, and even this season, I bought both his genuine love for his daughter and that he could casually allow her to be killed if his plan to destroy DS9 had succeeded. I think the Dukat we've been shown for six years plus the recent stresses credibly make the Dukat we get in this episode. Matthew: To be sure, this episode is sort of a "well, we need to follow up on Dukat now" story. Sisko on the Honshu for some hearing that is a mere formality? Come on. But they went to interesting places with it. Creating a story that lets two fine actors go at it is a good move. Adding the additional characters was a good way of preventing monotony, too. Kevin: Dukat's deterioration and Sisko's responses also work overall for me. The chorus of Kira, Weyoun, and Damar works, since the characters and the actors have such history and chemistry. I liked the way the needling felt like it was increasing in intensity. The entire arc of the episode felt like it was really building to something, and that's fun to watch. I also think Sisko's attempts to manage Dukat played well, too. Avoiding, then placating, and finally confronting Dukat felt very credible. Matthew: I agree with this, but I think (and you address this below) that we could have gotten a longer development of Sisko's reaction to Dukat. I think it was revealed a bit too early that he was nutso, so the tension of the viewer wondering whether Sisko would find out was blunted. In some ways this episode makes me think of "Liaisons" from TNG Season 7. While certainly a lesser episode than this, it effectively drew out Picard's discovery that he was being jerked around. I would have liked a bit more ambiguity in Sisko, perhaps even some small feeling of camaraderie. More time would have given us maybe a scene of Dukat selflessly rescuing Sisko, instead of just telling us about it in dialogue. Kevin: The only weak part of the episode for me is the scenes on the Defiant. First, it's unnecessary filler. Second, a lot of the reactions read really badly. Could you disguise your active disappointment that it wasn't Captain Sisko you just beamed up? The Federation convoy was an obvious plot device, but they're all Starfleet officers. They should be upset about it, and do their damnedest to find a way around it, but the rank insubordination and shock that Worf would choose the safety of several thousand troops over one man read really flat to me. They all get what it means to be a Starfleet officer, particularly in wartime. I would have preferred we just stay on the planet with Dukat and Sisko the whole time. Matthew: The bait and switch scenes did not feel tense or exciting or even disappointing to me, they just felt cheap. I agree that they wasted time that could have been better spent between the two principals. Also, it would have been a much more effective and tense situation if rescuers arrived during the final confrontation, but we didn't know who they were until the last possible moment. Kevin: We've critiqued Brooks' more extreme acting choices in the past, but I think he plays it well here. He really only raises his voice in the final final confrontation with Dukat, and that works. I was not the biggest fan of an explicit discourse on the nature of pure evil as a writing choice, but I think Sisko did well with the lines, keep his performance low-key to telegraph resolve more than anger. Matthew: The only line reading I didn't like from Brooks was "Do it!" Otherwise, I agree. I think the writing didn't give him everything it could have, but he really delivered a controlled performance that kept me interested. Kevin: The star of the episode is obviously Dukat, and he really sells it, top to bottom. He has to give the character the correct build in temperature and pressure, or the explosion at the end doesn't resonate with the viewer. In many ways, I felt he found the right place to exaggerate the qualities we know Dukat to have to make it feel credible and like he was really spinning out of control. I will give a shout-out to Visitor, Combs, and Biggs for good work with their role as his internal chorus. Weyoun in particular mocking Dukat was just great. Matthew: Indeed, Alaimo was excellent as always. His physical choices were really good, the way he held himself, walked around. He really is gifted in terms of physical projection. I thought Nana Visitor was particularly good. Her derision was really cutting, which made sense for the character as a figment of Dukat's imagination. Really, this is a well acted episode all around. Kevin: The cave was clearly a Planet Hell set, but what can you do? The camera work as good and the jump cuts to show the hallucinations there then not there were good. Rene Auberjonois did a good job keeping the pacing and focus nice and taut over the episode. Matthew: The opening shot of the USS Honshu was CGI, and pretty good CGI at that. The interior corridors, however, were bland Defiant re-uses. I thought the cave could have used some more visual interest. 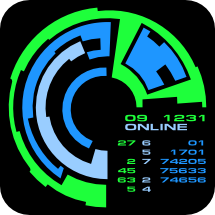 I miss TOS caves, you know? They had different colors, neat stalactites, lighting filters... sigh. Kevin: This episode reminds me of Duet, and I think the comparison is useful. There, we also had a taut interpersonal drama, but there was a little something extra in both the personal growth for Kira and the interesting allegory in the parallels to hunting down Nazis after World War II. Here, we really only learn that Dukat is actually as evil as we always suspected. It's a good, taut drama and I'd watch Marc Alaimo lose his mind any day of the week, but I still think this comes in at a high 4, just shy of the 5. Maybe cutting the unnecessary Defiant scenes could have given the additional space for something else. Matthew: I think the story on its own is a 3 given the issues you've mentioned. But I think the acting brings it up to 4 territory. 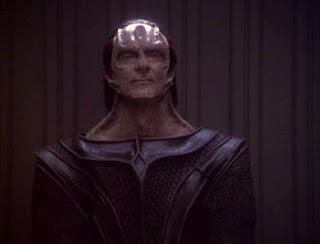 "Put Dukat in a room and let him monologue" is a pretty solid plan for entertainment. It also gave us an interesting insight into the way Dukat thinks he is perceived. So that makes for an agreement and a total of 8. Deep Space Nine, Season 6: Who Mourns for Morn?